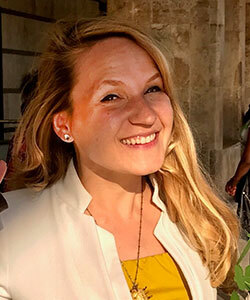 With CEA since 2008, Emily Schiavone is responsible for the management and development of the Florence Study Center and all study abroad programs that it hosts. Since 2014, Emily has provided leadership and direct oversight to the Student Services team, and works closely with the Academic Director on academic matters regarding the Florence Center and partner institutions. Emily hails from northeast Ohio, and holds a BA in Art History from Carleton College and an MA in Italian Renaissance Art from Syracuse University. Two study abroad experiences in Florence prompted Emily to remain after her third stint abroad, and she has called Florence her permanent home since 2004. Before joining CEA, Emily worked at an American university in Florence, where she helped to create an archive and database of digital images for teaching purposes and travelled to towns in central Italy to teach students art and architectural history on-site. Emily’s life would not be the same had she not come to Florence as a university student. She hopes that students embark their own journey with an open mind, preparedness for unpredictable situations, and confidence; attributes that allow students to discover new things about the world and about themselves. 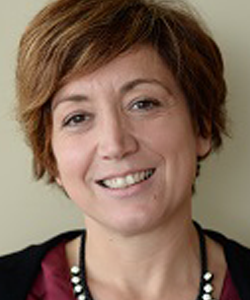 Academic Director Monica Francioso joined the CEA Florence team in 2015, and is responsible for the oversight of all aspects of Florence academics including academic integrity, curriculum development, and faculty training and assessment. She serves as a leader for students and faculty, and her work ensures compliance with the standards established by our School of Record agreement with the University of New Haven. Monica holds regular on-campus office hours and is always happy to talk to students and faculty on academic matters, and to respond to all substantive inquiries and concerns. Monica obtained a BA in English and Russian from the Università degli Studi di Padova, an MA in English Studies, and a Ph.D. in Italian Studies from Royal Holloway, University of London. Her thesis, which she is currently editing for publication, focuses on narrative theory in post-war Italy. She has published articles and books, both in Italian and English, on Celati, Calvino, Palandri, and migrant writers. Monica lived abroad in the United Kingdom and Ireland for 13 years. 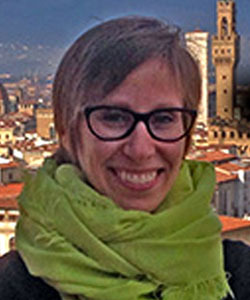 Prior to joining the CEA Florence team, Monica held several teaching positions in Italian language, literature and culture at various higher-ed institutions, including Royal Holloway University of London, University of Durham, University of Bath and University College Dublin. She earned a CELTA certificate to teach English as a foreign and second language. She also taught English to students of all levels, preparing them for the Cambridge English exams. Monica also holds a DITALS II certificate to teach Italian as a foreign and second language, and she worked as a teacher trainer for the same program. Monica firmly believes in the importance of studying abroad as a means to broaden horizons and better oneself. Her experiences have shown her how enriching speaking/learning other languages and knowing other cultures can be. She believes she would be a different person today had she not experienced life abroad. 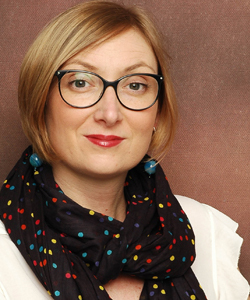 With CEA since 2009, Letizia Ialini liaises with local housing providers to ensure quality accommodation and services to all CEA Florence students. She also collaborates to design and implement Custom and Faculty-Led programs. As well as working frequently with colleagues on various aspects of programs and to help resolve student issues. Her wide-ranging experience in administration makes Letizia a strong asset to the Florence team. Letizia studied Economics at the University of Florence. As a student, she moved to Bournemouth, England where she worked as a trainee in the financial department of an industrial company. This first experience abroad sparked her interest in traveling and learning, inspiring her to study for a year in Melbourne, Australia. There she perfected her English, travelled often and made friends from all around the world. Prior to joining CEA, Letizia managed the technical office of Prato Trade, a branch of the Industrial Union of Prato, where she organized expositions for national and international trade fairs. She also worked for a Florentine cooking school. In her spare time, Letizia enjoys cooking, reading, and traveling. 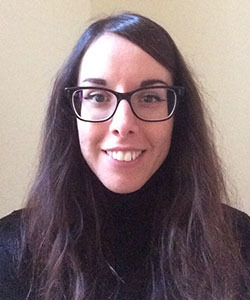 She loves to help students connect with Italian culture, and believes that overcoming the challenge of culture shock results in growth and flexibility that can help students in their professional and personal lives. As Internship & Student Services Coordinator, Daniele Bini helps CEA Florence students acclimate to their new home abroad. Daniele manages the Internship program in Florence, finding local host institutions and interviewing incoming students—while working to find matches that will benefit both hosts and interns. Together, with the internship seminar instructor, Daniele follows Interns’ experiences until the end of the program. He also organizes excursions that help introduce students to Italian locations beyond Florence. 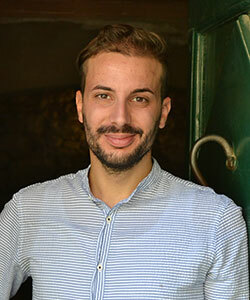 Daniele holds a degree in Languages from the University of Florence, where he studied English, Japanese, and Portuguese. To complete his studies, Daniele fulfilled a 150-hour internship with CEA. But before joining the Florence team as a staff member in 2014, Daniele worked at a hotel in Chianti and assisted CEA with student arrivals and language exchanges. 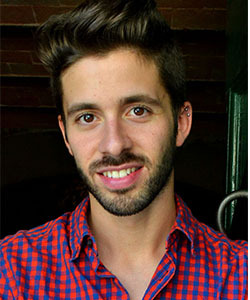 Tommaso Bonaiuti joined the CEA Florence Student Services team in December 2015. As Academic & Student Services Coordinator, he works with professors and the Academic Director to ensure that visits outside the classroom run smoothly. And since August 2018 has served as a bridge between Student Services and Academics. Tommaso also helps identify volunteer opportunities for CEA students, as well as working with other members of the Student Services team to help students with non-academic issues during their time abroad. With a degree in translation and interpreting from the SSML Carlo University in Florence, Tammaso studied English, Spanish, and Russian while he was there. He continued his studies in Turin, Northern Italy, where he earned a Master’s degree in technical and scientific translation, and also worked with several translation agencies before joining CEA. Travel is Tommaso’s greatest passion, and he dreams of traveling as much as possible. While he did not study abroad during his university career, Tommaso has already travelled to over 16 countries, and is always ready to jump on an airplane and see something new. As Student Services Assistant, Marissa Racht Ryan helps CEA Florence students acclimate to their new home abroad. A font of information about Florence, Marissa encourages engagement with the host city, and is a point of reference for everyday questions. She also helps resolve housing issues in a timely manner. Marissa holds a BA from Marywood University in Fine Arts, Theatre, and Broadcast Communications for Set Design and Art Direction for Film and Theatre. She studied abroad for the first time in Florence in 2001 and received a Post Baccalaureate degree in Art Conservation; this experience cultivated her passion for Italian art, culture and language. After she finished her conservation studies, she worked professionally as an art conservator for 13 years, living between Italy and the U.S. In 2014, Marissa moved back to Florence full-time to complete a Master’s degree in Contemporary Jewellery and Body Ornament. Marissa occasionally teaches jewellery as an adjunct professor to U.S. and international students studying in Florence. She loves teaching and working with students in general. Living in a different culture fascinates her and allows her to view her own culture from a new perspective. This cultural awareness allows her to help students acclimate to their new environment, in addition to inspiring her artwork. As Student Services Assistant, Alice Pagano helps CEA students feel at home while in Florence. She supports them in their everyday requests and helps them make the most of their time abroad by giving tips on life in Florence. She also organizes CEA activities, which help students learn more about the Florentine and Italian culture outside of the classroom. Alice considers her job very important and values the interaction with students as a great opportunity for cultural and personal enrichment. Alice holds a degree in foreign languages from the University of Florence, where she studied English, Spanish, and French. As part of her studies, Alice completed an internship with an American university in Florence, and after graduating, she worked in the fashion industry for Florentine designer Salvatore Ferragamo. She joined the CEA Florence team in December 2017. Alice has had a passion for learning languages since she was a child, and she plans on becoming a certified teacher of Italian as a foreign and second language. She understands the benefits and challenges of living abroad, as she herself had a study experience in Portsmouth, UK when she was 19. Alice strongly believes in the importance of studying abroad, as it can help students overcome their limitations and learn to embrace different cultures.